I was listening to the Feldman & Maloney show on Sportstalk980, when I heard some of the most ridiculous statements that I have heard in a very long time. First let me put out my disclaimer – I was born and raised a Steelers fan, but I have followed (and grown to love) the Redskins for the last 11 years. So I am pointing out that I have divided loyalties. It made watching the game on Saturday very difficult, I didn’t know who to cheer for. But I digress. Carol Maloney said that she felt Brett Keisel’s hit on Jason Campbell was a cheap shot and he should have been ejected from the game. She went on to point out that she believed that it was Keisel’s, if not the Steelers, intention to hurt Campbell. I was amazed at what I was hearing. She continued by pointing out Kimo von Oelhoffen’s hit on Carson Palmer during the 2005 playoffs as proof that the Steelers have some sort of history with injuring opposing team’s Quarterbacks. But beyond Maloney’s rant – which she is entitled to – however misinformed it is. I was completely shocked that Trevor Matich, a former NFL player, would agree with her opinion. 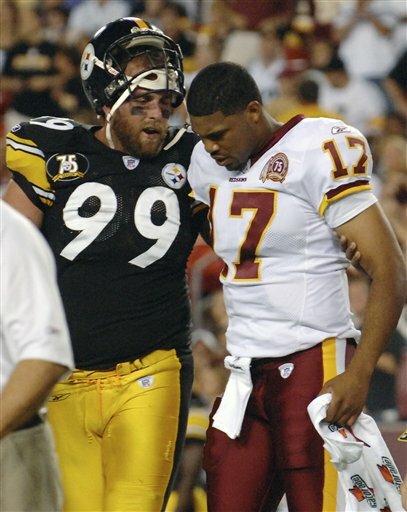 Trevor went on to state that Keisel was not stumbling, that he could have absolutely controlled his body – during flight – that he could have just put his arm out. I could not believe I was hearing a former NFL player. He then went on to say that if he were coaching the Redskins defense that he would have sent everyone after Rothlisberger. Since Campbell got injured, on a dirty play, then he would have made sure that Big Ben was sidelined for the rest of the year. The only person on the show who seemed to have a sensible opinion on the matter was Andy Pollen who was sitting in for Feldman. Those of us who have watched football for any length of time and/or played it at any meaningful level know that it is a dangerous sport and that at any moment you can get injured. Thankfully it appears that Jason’s injury is not serious. My point to Maloney or Matich would have been – show me evidence that this was intentional? Furthermore, what would the Steelers have gotten out of this “intentional cheap shot?” What would they have to gain? The last I checked the Redskins are in the NFC and the Steelers play in the AFC. The Steelers would gain nothing from intentionally injuring Campbell. I could follow the logic IF it were the Cowboys and the Redskins in a pre-season game. Then you could make the argument that the Cowboys would gain something from Campbell being injured. As part of Matich’s argument he points out that a penalty was called on the play for hitting the QB during a pass below the waist. A flag in and of itself does not make a play dirty. Hell, there are times when cheap shots are not caught by the refs by his line of logic does that mean those plays were legal? What I find interesting in the replay is that the flag does not actually come in to the picture until after Cooley has caught the pass, turned up field and gets tackled. Now, I am not pointing out that it wasn’t a penalty, by the letter of the rule it was. And on the replay I have you can not see where the Umpire is in relation to the play, so maybe he through it much earlier and it took a while for it to make it into view of the camera. But I am pointing out that it appeared as if it took him a while to decide that was a low tackle – but at least he did get the call right. But consider that it appeared that there was some indecision on the part of the Umpire but clearly he did not think that it was a dirty play or he would have ejected him from the game. After watching the play in person and countless times on Tivo, I can only conclude that Maloney and Matich’s comments were completely baseless and a touch reckless. It is okay to be a bit upset with the fact that the starting Quarterback got injured during a meaningless game, but unless you have clear proof that someone intended to injury him, don’t go on record claiming that they did. I have seen plenty of cheap shots over the years, and I do not put that play in that category. Unfortunate yes, cheap shot no! While it is pre-season and you do not want to rush to any judgments, it is important to see how well individuals or portions of teams are playing. With that said, it was nice to see the Redskins defense playing as well as they did against the Titans. Now, this was a Titans offense without Vince Young, but let’s keep in mind that Kerry Collins is not that far removed from being a starter in the league. Regardless, the defense, in one pre-season game, appeared to be playing closer to their level of 2 years ago. The combination of London Fletcher, Sean Taylor and LaRon Landry provide for a group of big hitters. While Sean had a fairly quite game, Fletcher and Landry both laid impressive hits on various Titans. Even more impressive than that, Fletcher proved to be in the middle of many tackles and demonstrated why the coaching staff went after him so hard in the off season. Another bright spot was Kedric Golston, who appears to be growing into the starting DT position opposite Cornelius Griffin. Let me say again that this was the first preseason game and I am not making any long-term predictions, but the defense collectively and some individuals showed that they may have returned to form. Now, once the offense gets on the same page – and begins keeping Campbell upright – there might be a reason for optimism this season.